MC's third annual dance marathon raised more than $42,222 to benefit the Blair Batson Children's Hospital in Jackson. 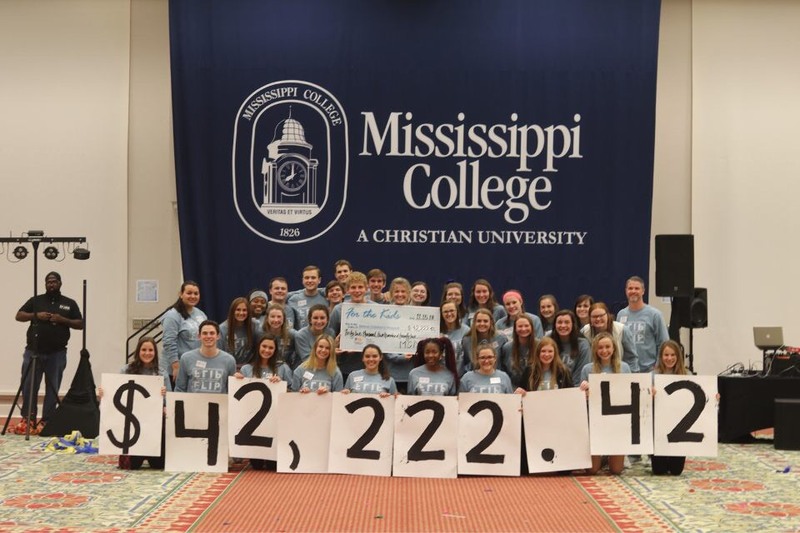 Wearing out their dancing shoes, Mississippi College students raised more than $42,222 to benefit the Blair Batson Children’s Hospital. During a lively Dance Marathon, students topped their $40,000 goal on the Clinton campus on November 15. There was time for slices of pizza, plenty of ice cream, cotton candy and loads of fun during the six-hour event. Sophomore Jill Dickerson, 20, of Memphis loved every minute she stayed on the dance floor at Anderson Hall. Raising money for patients at the Blair Batson Children’s Hospital was thrilling. “But it also gave us a chance to hear their stories and hang out with them here on our own campus,” she said. “Plus, we’re with all our friends dancing, eating and laughing. It’s an event I look forward to each year,” says Dickerson, a public relations major. Led by talented instructors, Mississippi College students tried Celtic dancing, hip-hop, Zumba, swing, salsa and other swift dance moves on Thursday evening. Student Government Association President Anthony Jackson of Mound Bayou was elated the Christian university’s administrators teamed with undergrads to make this event so successful. Mississippi College’s third annual dance marathon featured solid organizational support from the freshmen leadership experience group. Administrators like Jonathan Ambrose have remained closely involved with MC dance marathons since day one. The activity raised awareness about the vital role the state’s children’s hospital plays at the University of Mississippi Medical Center. It showed “the importance of this hospital in our area,” he said. The hospital treats thousands of children each year in more than 30 specialty areas. The medical facility in Jackson offers everything from emergency care to highly specialized heart and cancer services for kids. Mississippi College’s 2017 dance marathon raised $23,312. This year’s marathon nearly doubled the effort a year ago. About 250 MC students participated on that Thursday evening until midnight. The funds raised will stay in Mississippi to help Children’s Miracle Network Hospitals and patients at the Blair Batson Children’s Hospital.